Band Director, Mr. Vince Genualdi, using the TonalEnergy Tuner app during his class to improve the band’s sound quality. Saint Viator High School has been recognized as an Apple Distinguished School for 2015–2017 for its implementation of its 1:1 iPad program. A rigorous education has been the hallmark of a Saint Viator education since it opened more than 50 years ago. But with the school’s innovative curriculum redesign, it leverages technology with academics. The Apple Distinguished School program is reserved for schools that meet criteria for innovation, leadership and educational excellence, and demonstrate a clear vision for exemplary learning environments. Maggie Miskowicz, coordinator of Saint Viator’s instructional technology, points to a few of Apple’s tools that have revolutionized its classrooms, such as iMovie, which brings to life student assignments, Keynote, which helps students present main points of a novel, and Numbers, where students collect data and create graphs. Mr. Mike Tubridy helping two incoming freshmen during an iPad Orientation session. Students this year have the opportunity to learn mobile app programming, while also taking advantage of “flipped classroom” lessons, where teachers videotape lectures that students can watch at home. That allows teachers to use classroom time for questions. “One of the most significant changes in student learning with the use of iPads is that learning takes place anywhere, anytime,” says Mrs. Eileen Cairo, science department chair. When Saint Viator administrators learned of the news, Mrs. Manno turned to faculty members who were on the front lines of implementing this new technology-driven curriculum design: “Thank you for embracing change,” she said. Fr. Corey Brost, C.S.V., described the distinction as another example of Saint Viator’s commitment to academic excellence and its goal of shaping young men and women to be successful in the classroom, as well as leaders in academics, athletics, faith and service to others. Sophomore students taking their Constitution exam in the secure SofTest-M app. Good morning everyone, and Happy Viator Day! It is an incredible honor to be here this morning to celebrate Viator Day with you, and to share some comments about how Viatorian values have impacted my life. Before I start, I couldn’t help reflecting… The last time I had a microphone in my hand in front of the whole Viator student body, was in September of 1983… first month of my freshman year at the first pep rally of the year. Back then, the tradition was for Mr. Mahoney (our Dean of Men) to pick one Freshman to come out of the crowd, to stand on a chair, and sing the school song. Well, as you might guess… he chose me. Yes, I hardly knew anyone, and could barely find the bathrooms in the building… and there I was, singing the school song, SOLO, in my squeaky 14-year-old voice, in front of my classmates, all the upper classmen, and the entire student body of girls from our sister school, Sacred Heart of Mary. I cannot tell you how grateful I am that YouTube was not around then. As it was, I found it hard to get dates in high school. YouTube video… could have been ugly. When someone is asked to deliver a “Keynote” talk… it sometimes implies that that person has figured everything out. In fact, it is often more than implied… some Keynote speakers actually believe that they do, in fact, know it all, and that their job is to bless their audience with all the pearls of wisdom they have amassed over the years. So, I thought I’d get this out there right away… don’t let the gray hair fool you… I do not know it all. Like all of us here today, I am a work in progress. If at any point my talk implies that I am more than that… you can do one of two things: 1) show me my Freshman year picture which will immediately humble me, or 2) remind me of one of my favorite Bible quotes, from Galatians 6: “But far be it for me to boast except in the cross of our Lord Jesus Christ, by which the world has been crucified to me and I to the world”. I prefer #2. The apostle Paul, by the way… there’s a Keynote speaker. So, what does it mean to be a Viatorian? What are the Viatorian Values? And what does it mean to truly live them out? As I begin, I’d like to first point out that you are all very fortunate to be in a building each day where you have countless examples of people living out the Viatorian values… Father Corey, Mrs. Manno, Mr. Majkowski, Mrs. Abrahamian, Mrs. Costello, Mr. Faltinoski, Mrs. King, … I could go on and on, but long after this talk, please remember to watch the men and women around you who model these values in plain sight each and every day. This morning, I thought I would share some stories from my life where being grounded in these Viatorian values not only helped me get through and survive, but also helped me grow and thrive. 1) Being willing to work hard: I am one of 6 kids in my family. Specifically, I am the 5th of 6, and the 4th of four boys. Being that spot in the family comes with some baggage to say the least… you always get hand-me-downs (I was 35 when I got my first new pair of hockey skates), you get toughened up (otherwise known as beaten up a bit) by your brothers, and you get the least desired chores, which as a result, teaches you a great work ethic… teaches you how to work hard. By the time I got to Viator as a student, the ability to work hard came in handy. I had to work to help pay my tuition. Paying tuition each month was never easy. Back then, the gentleman in charge of the school’s finances was Lew Lekan, a Catholic Deacon. Yes, Deacon Lekan. On more than one occasion, I needed to creatively duck and intentionally avoid Deacon Lekan as he scoured the hallways in search of delinquent tuition payers just like me. Being short really helped. Looking back, I know Viator would have done anything it had to, to help us out. But at that time, staying at Viator meant working hard, and that is what I did. Viator taught me to work hard… in class, on stage, and on the athletic field. I played baseball as a Freshman, but my Soph and Junior years, I could not play because of my job. By Senior year, I had enough saved where once again, I could play. One catch though, I had to make the team. At most schools, a Senior who did not play as a Soph or Junior would have zero chance to make the team. Water boy might be a stretch. When I went to Coach Pirman (Chico) to let him know I was interested, I was expecting to be discouraged. Instead, he said go for it. He didn’t make it easy. 17 of the 18 spots on the team were filled after the 1st round of tryouts. He made me compete with 10 younger guys for that last spot. With his encouragement, I earned that spot… I was 3rd string at every position. After a few games, I got my shot and ultimately earned a spot in the starting lineup, the pitching rotation, and made honorable mention All Conference. Not quite Athletic Hall of Fame material, but the value of working hard was drilled into me. This continued to serve me well, as I worked to pay for college and grad school. Still to this day, working hard, something I learned at Viator, is a major part of my life. I have developed a weird trait of waking up to start my day at 5:30a, no matter what time I went to bed. And I think working hard like that honors God. Colossians 3 tells us “Whatever you do, work heartily, as for the Lord and not for men”. That is a Viatorian value. 2) Having faith in Jesus and a grounding in Spirituality: I had never heard of or certainly been on a retreat until I became a student at St. Viator. In fact, while faith was a part of my life growing up, I don’t think I ever really got to know Jesus or truly contemplate his life, his death, or his resurrection until I got here. As a student at Viator, retreats helped me slow down and just take in the world that God created. Each year we did retreats, and each year I became more comfortable just hanging out with God. I did become more grounded in spirituality as a high school student. But it was actually 5+ years after I graduated high school, 1991, that I truly learned the power of spirituality and really felt the presence of God. I was working here at Viator as the Recruitment Director. The Campus Ministry team (Judy Amberg and Brother Rob Robertson) asked if I might consider taking 3 days to go on a retreat with a bunch of kids from Loyola Academy. At the time, our Campus Ministry team was contemplating bringing a new kind of retreat to St. Viator… a retreat called Kairos. They wanted people in the building to get a sense of what it was like before they committed. Was it any good, they wondered? I joined a group of people from Loyola that I’d never met before, as an adult Kairos leader. In short, WOW. That experience was awesome. I’d never really encountered God in such a close-up, personal way. As I returned to Viator, I had the great joy of being part of the team that put together and led Kairos 1. In my three years of working at Viator, I went on multiple Kairos retreats, each one seemingly better than the last. Well beyond my high school years, Viator was once again teaching me the importance of a strong faith in Jesus and the critical need we have as people to slow down and be in communion with God the father. Ya know… There are a lot of great high schools around here. 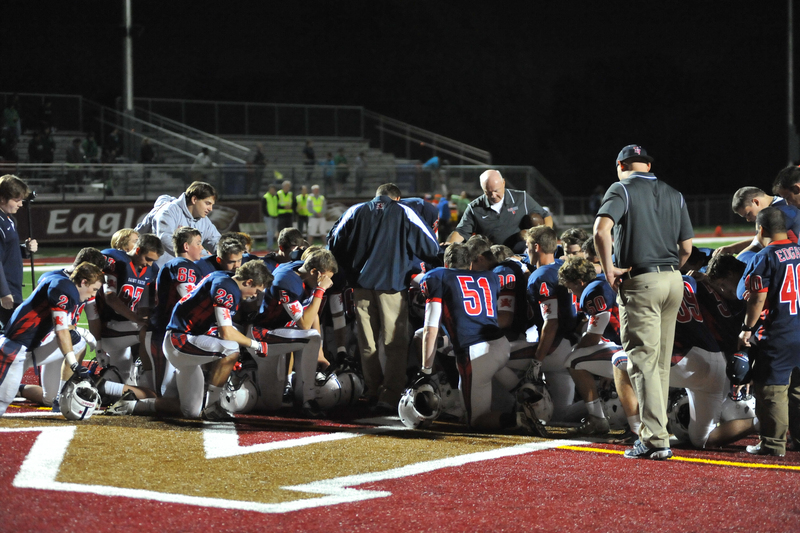 Strong academics, strong athletic teams… we have them at Viator for sure, but honestly, others do as well. Here’s the thing. This building and this school exist because of Jesus Christ. As members of the Viator community, we need to always remember that, celebrate that, and let that be at the center of every one of our days… whether we are on retreat or not, grounding ourselves in spirituality puts us in touch with our creator and helps us understand his purpose for our lives. Psalm 37 tells us: “Trust in the Lord, and do good; dwell in the land and befriend faithfulness. Delight yourself in the Lord, and he will give you the desires of your heart”. Delighting in the Lord and grounding your life in his spirit… that is a Viatorian value. 3) Showing courage to be different and to stand for something: I am 47 now. During my teens, 20’s and 30’s… the world was a simpler place. I think being different or taking a stand for something was actually a bit easier back then, without having to worry about someone posting something on the web and calling me out in front of the world. I say special prayers for kids today around this very topic. That said, being different or taking a stand may have been a bit easier, but it never has been nor will it ever be EASY. When we do have the courage, though, God tends to reward us. Here’s a college story… Keeping it real… I am not, nor have I ever been, an angel. In high school and in college, I did things that I am not proud of, and I have confessed them to the Lord many times. Thank God for forgiveness. Looking back, though, the transition from the St. Viator High School to the University of Illinois was difficult. Everything there was bigger. Everything there was scarier. And with my parents not around, everything there was way more accessible. During the first semester of my Freshman year at U of I, I pledged a fraternity. There were some Viator guys in the Frat, so I figured the whole Frat thing was going to be an extension of my Viator experience… of the Viator community. In short, I was wrong. I will share no names, dates, or details… but the things I saw as a new pledge just never felt right. I saw abuse of alcohol. I saw abuse of drugs, and I saw academic dishonesty. Again, I was no angel, but the things I saw just felt foreign to me. As much as I loved the friendships with the guys, they were not built on a good foundation, and they were destined to be harmful. Something inside me said to get out. After 8 weeks of pledgeship, as the president of my pledge class, I quit the fraternity. I was not passing judgment on the members, because I knew I was not without blame. But in my heart, I knew I did not belong in that world. I left the house, and went back to the dorms. Through relationships I built that next semester in the dorms, I eventually met my beautiful wife of 21 years, Carla. It hard to imagine… I may never have met my wife had God not instilled in me, through my experience at Viator, the courage to take a stand and choose a different path. The book of Joshua tells us: “Be strong and courageous. Do not be frightened, and do not be dismayed, for the Lord your God is with you wherever you go.” Having the strength and courage to stand and act on what you believe. That is a Viatorian value. 4) Having and demonstrating a heart of service… One of the greatest lessons I have ever learned about leadership, I learned right here… in fact, a lot of it was in this very gym. Not as a student, but as a Coach. From 1991-1993, I served as the Head Freshman baseball coach and then the Assistant Varsity baseball coach. You may recognize two tremendous players from that storied Viator baseball era… Mike Manno and Matt Hynek. While I have not talked to either of them about this, watching them from afar, I would guess that they have learned the very same lesson, as they are great leaders. Here it is… the key to leading people is having a heart to serve those people. It’s really quite simple. The very best leaders are the ones who put their own needs behind those of the people they lead… and somehow… it just seems to work out better for everyone. 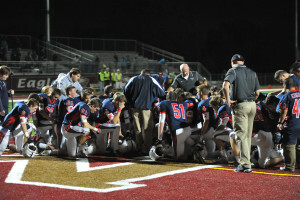 I learned that in my first leadership role as a Coach here at Viator at the age of 23. And I continued to learn and grow in that same principle, that same value… as I served as the CEO of SAVO from 1999 – 2010. SAVO has won many accolades over the years… (Inc. 500 fastest growing company, Tribune’s best places to work in Chicago many years, innovation awards)… it has been a blast to see the company grow and see many people come into the company, provide well for their families, and also thrive in their careers, achieving things they did not think they could. But of all the wonderful accolades associated with this era of my life… there is one number that stands out to me as most special. The number 20. Since SAVO began, there are 20 people that have worked there, who then went on to start their own companies. How cool is that? 20 people were a part of our journey at SAVO and grew to a point that they, too, felt they could branch out and take their own crack at entrepreneurship. Some have failed, some have succeeded. But, their success or failure is not what matters. What matters is that they were served well at SAVO… they were developed, encouraged, and equipped to follow their own dreams. Like many entrepreneurs, I have made some bad decisions… But the decision I made to base my leadership style on that of a servant… to base my leadership style on that of Jesus (the ultimate servant leader)… was a decision made on values, and it has had a huge impact on my life and I hope many others as well. Jesus said to his apostles in Mark Chapter 9: “If anyone would be first, he must be last of all and servant of all.” That is a Viatorian value. • Radio—In 2010, our radio program was aired on 35 radio stations in the US. Today it airs on 196. In 2010, approximately 75,000 people heard the program each day. Today, we have more than 500,000 daily listeners. Praise God. • Online—In 2010, we had 65,000 people visit our website to read/download content. In 2015, that number will be almost 10x bigger, over 600,000 people. Praise God. • Social Media—We launched Facebook, Twitter, and YouTube pages in 2010 and had 700 people following us. As of today, there are more than 70,000 people who actively follow us when we post anything on social media. Praise God. The growth of the ministry has been awesome, but let me make something crystal clear… God could have done all of these things without me. That is for sure. But is has been an absolute joy to be used as part of this growth. It was the willingness to be open to being used that made the difference. That, and being unashamed of the Gospel, something I learned in this building. In his letter to the church in Rome, the apostle Paul tells us: “I am not ashamed of the gospel, for it is the power of God for salvation to everyone who believes”. That is a Viatorian value. Putting this talk together reminded me yet again, what a privilege it is to be a part of the Viatorian community… a community comprised of people from many different backgrounds, yet who share certain things in common… certain core values. Guys and gals… you are part of something bigger than you, bigger than just a high school. You are part of a legacy of these very values being lived out by many who have come before you. I encourage you to take advantage of that legacy. Sit down with an alum (you have so many who teach here now) and chat with them about what matters… their values. Ask them how it feels to serve in the way they do. Seek their guidance. But in addition to encouraging you to take advantage of this Viatorian legacy… this morning, I want to ask you boldly, “How will you add to that legacy?” Be what all the brochures say… be a Lion for life. Work really hard at everything set before you, ground yourself in your faith and spirituality, have courage to make hard but right decisions, serve others as Christ served you, and speak boldly about Jesus wherever you go. That is what it means to be a Lion for life. That is what it means to be a Viatorian. Students in Saint Viator’s Justice League hit the road again to learn about diversity, first hand. The Saint Viator delegation, which included nine seniors, Fr. Corey Brost, CSV, and Ms. Egan, were among more than 10,000 people from 80 nations and 50 faith traditions to attend. Justice League members strive to live out their faith in a way that makes the world a more peaceful place. Quarterly school projects as well as occasional trips help to raise awareness and respond to a social injustice. Previous trips this year have taken students to Arizona in June to observe the border patrol, as well as to the Houses of Hospitality in Chicago, supported in part by Viatorians, in support of recently released immigrants with nowhere else to go. Saint Viator students had the chance to meet with people from different faith traditions — from learning about Sikh traditions and observing Tibetan monks, to receiving a native American sage blessing and celebrating the Jewish Sabbath. Just to open the Parliament, they observed a Vedic chant, from the Hindu tradition. Fr. Dan Hall, CSV, just took one step closer to his goal. The military veteran, who served two tours of duty in Vietnam in the Army’s special services and spent seven years in the Marines as a chaplain, has set out to complete 50 marathons — after turning 50 years old. Running the Bank of America Chicago Marathon was his 47th — and he has two more scheduled this year. “It gets harder and harder each year. I always aim to finish before sunset,” says Fr. Hall, who celebrated 33 years of religious life this year and 27 as a priest. When he’s not training, Fr. Hall teaches U.S. history, global economics and contemporary world issues at Saint Viator High School, before heading out to football practice, where he is a special teams coach. In two weeks, on Oct. 25, Fr. Hall will run one of his favorite races, the Marine Corps Marathon. It starts in Arlington, VA and takes runners between Arlington National Cemetery and the Pentagon, and winds up at the Marine Corps Memorial. He winds up this year’s campaign on Nov. 8, when he runs the Madison Marathon, which starts and finishes at Capitol Square in downtown Madison. For the Chicago Marathon, Fr. 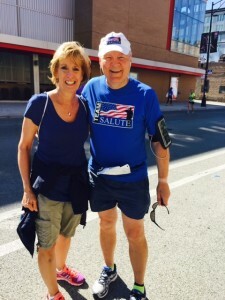 Hall joined the 120 members of Team Salute, which is based in Arlington Heights and raised more than $120,000 for injured and returning military personnel. Individual inductees, Mike Hare ’97, Jennifer Kohnke Davis ’97, Daniel Klingberg ’68, Mary Krause Orr ’80 and Mike McManus ’87. This year’s Saint Viator and Sacred Heart of Mary Athletic Hall of Fame ceremony had it all: an emotional tribute to the former longtime athletic director, Bob Artman, as well as honorees whose records — and state championships — have stood the test of time. It was the 18th year for the induction ceremony, only guests found a slightly different tribute from years past. For starters, one of the forces behind the event, former dean of men and development director, Patrick Mahoney, turned over emcee duties to Jim Bristol ’73. Fr. Charles Bolser, CSV, former president of Saint Viator, helped open the event as he dedicated the Hall of Fame hallway, located between the Boler Center and the Cahill Gym, in memory of the late Robert C. Artman, who served as athletic director for 26 years before he passed away in 2005. His wife, Georgeanne, and children Robert ’89 and Meg ’92 were in attendance for the momentous occasion. Georgeanne Artman, wife of Bob, attended the ceremony with her children, Robert ’89 and Meg ’92. After the dedication, guests moved to Querbes Hall, for the start of the induction ceremony. In the past, the ceremony has taken place in Mahoney Court, the school’s second gym, but the more than 130 people who attended found the newly renovated dining facility a more intimate venue for the event. During the evening, they learned of the accomplishments of five individuals, two teams and the Artman award winner. Bristol was able to congratulate his classmate, Thomas Chapman ’73, on being this year’s Artman Award winner. Chapman has served as a volunteer coach and role model to members of the baseball team for the last six years. Also inducted during the evening, were Daniel Klingberg ’68, Mary Krause Orr ’80, Mike McManus ’87, Jennifer Kohnke Davis ’97 and Mike Hare ’97. The two outstanding teams inducted into the Hall of Fame included the 2002 Girls’ Basketball team, which established a school record for wins, and the 2003 Boys’ Soccer team, which won the IHSA Class A Championship. Each year, five to six alumni are inducted into the Athletic Hall of Fame. With the recently completed renovations to the school, committee members opted to move the induction ceremony and dinner to Querbes Hall, where inductees were able to choose who would introduce them. “It’s great to see everyone mingling and sharing stories from the good old days,” Mahoney said. “It’s the humor that carries the show,” says Director Kate Costello. Colorful costumes, slapstick comedy and wacky one-liners. It hardly sounds like the makings of a Greek comedy, but that’s exactly what Saint Viator High School students deliver in presentation of their fall play, The Birds. “We’re satirizing a lot of aspects of government and society, from taxes and laws, to corruption,” says junior Hugh Tully, who shares one of the lead roles with sophomore Jeremy Yoder. Both play sidekicks to the other lead role, shared by juniors Bryan Rapala and Zac Jones. The lead characters speak directly to the audience about how they are fed up with all the fraud and politics in their society and consequently, they travel out to a high land where the birds dwell. There, they persuade the birds to set up their own kingdom, the Cloud Cuckoo Land, fight the gods and establish their own supremacy on earth. Senior Bryan Rapala, left, and junior Hugh Tully, right, headline the cast of the fall play, The Birds. “It’s very silly humor about serious topics,” adds junior Matthew Frank, who plays Epops, a king turned into a hoopoe by Apollo. The bird chorus nearly steals the show. With their layered, multi-colored costumes—self-designed by the student actors—and their ensemble scenes, they brighten up the entire stage. “I love being a bird,” declares junior Katie Boler, who chose a lime green design for her role as an Australian kiwi bird. Each bird represents a different species, and students researched their colors, spots and wing spans—not to mention bird calls—in creating their costumes. As an educator, Costello looks for teaching moments in the plays she chooses each fall. From its dialogue delivered in comic-patter and some of it in rhyme, to its satire of serious topics, Costello says students are learning more than delivering their lines. Fr. Corey Brost, CSV, served as the keynote speaker at a first-time, community-wide prayer vigil in Arlington Heights that highlighted the issue of family violence and ways to prevent it. The ecumenical service was organized by domestic abuse ministries at churches throughout the village, and was timed with National Domestic Violence Awareness month. Domestic violence is the leading cause of injury requiring serious medical attention for women — of all socio-economic, ethnic and cultural backgrounds — organizers say. Yet, victims also include men, teens, children, elderly adults and lesbian, gay, bi-sexual and transgender people. Organizers pointed to these statistics: One in three women and one in four men have been victims of some form of physical violence by an intimate partner. In addition, one in 15 children are exposed to this type of violence — and 90 percent of them are eyewitnesses to this abuse. “Domestic violence, child abuse, dating violence and elder abuse happen in all communities,” said Terri McDonnell, of the Stepping Stones ministry at St. James Catholic Church in Arlington Heights. “We know that abuse is under-reported and that victims often suffer in silence.